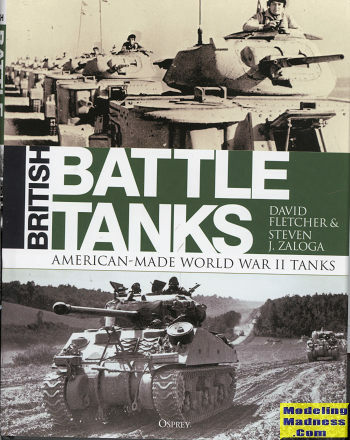 T his addition to Osprey Publishing's 'Battle Tanks' series concentrates on US tanks and other AFVs used by British and Commonwealth nations. The British were not unable to develop tanks, it is just that their tanks were, until the end of the war, under gunned, underpowered, and unreliable. It wasn't until the develop of the Meteor engine, itself an off-shoot of the famous Merlin aircraft engine, that British tanks were able to have the power of contemporaries. The 76mm gun used on the Firefly enabled the sort of firepower needed and constant development provided the reliability that was needed. However, the truth in 1941 was that what the British were using in combat was substandard and easy prey for German armor of the time. It didn't help that British manufacturers were maxed out with the war effort and there was considerable infighting among the 'tank men' in the British army. It was then that they sought armor from the only place that could realistically provide it, which was the United States. Even here US tanks were at a disadvantage to the Germans, though not to the level of locally produced tanks. US tanks had some major quirks, but they were mechanically reliable and had fairly decent firepower and armor. In addition, they were available. In fact, so available were US AFVs that well over half of British armored units were equipped with American gear right up to the end of the conflict. In this book, the authors use quite a few previous works from Osprey in this compilation. It starts with the light tanks, and in this case it is the M3 and M5 Stuarts that are the main focus. The Stuart was a real plus for the British. Though lightly gunned and armored, it was fast and reliable, just what was needed for the reconnaissance units. Then it moves on to the medium tanks. In this case it was the M3 and M4. The British did not like the small turret of the US M3, which they called the Lee and developed a larger turret for their use. This was the Grant. They did like the 75mm gun, but were less than thrilled by its limited traverse. It did, however, make for a very good infantry support tank. The M4 Sherman was the most widely used Western Allied tank of the war. The British developed the Sherman into a wide variety of different vehicles. It's these developments that I found to be the most fascinating part of the book. These non-standard tanks were the DD (Direct Drive) amphibious tanks, the mine clearing 'flail' tanks, and the Firefly. The authors go into considerable detail regarding the development of all of these as the DD and flail tanks started off with other hulls before being developed on the Sherman. There are also sections on the M22 Locust and the Staghound, along with others that never really got into the production stage. Samples of these tanks were sent to the British, but no orders were forthcoming or, like the M26, they were too late in the war to be 'shared'. The book is a great read and unless you are an avid tank fanatic, you will find most of this to be new material. I very much enjoyed reading it and highly recommend it to you.